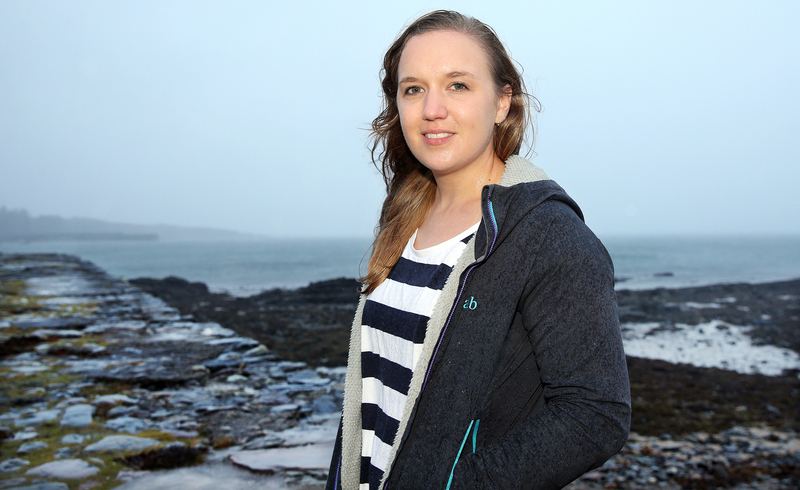 Skye conservationist Ellie MacLennan has just returned from a prestigious Churchill fellowship in the USA and Canada, researching how whale entanglement in fishing gear is being tackled there. Ellie returned in November after spending time working with some of the busiest whale disentanglement teams in the world. She hopes the good practices she observed can be replicated in Scotland. Globally, over 300,000 whales, dolphins and porpoise are killed each year because of incidental capture – bycatch – in fishing gear. Not only is this a concern from an animal welfare and conservation perspective, but it can also result in economic losses for fishermen through lost catches, and time spent searching for and replacing lost gear. This is increasingly becoming an issue in Scotland, with a recent report commissioned by the International Whaling Commission finding that humpback whales in Scottish inshore waters may have as high as a 46 per cent chance of becoming entangled in fishing ropes. Ellie is a marine conservation researcher from Broadford, and during her fellowship, awarded by the Winston Churchill Memorial Trust, she visited both the west and east coasts of the USA and the east coast of Canada. As well as spending time with disentanglement teams, she also met representatives of federal agencies, fisheries and conservation organisations, and scientists and engineers from research facilities, all of whom were actively involved in finding ways to mitigate this issue. Highlights from Ellie’s trip included working with the Provincetown Center for Coastal Studies team on Cape Cod, who had unrivalled experience, facilities, response times and procedures, and the Whale Release and Strandings Group in Newfoundland, led by husband and wife Wayne Ledwell and Julie Huntington, who have released more entangled whales than any other team globally, despite operating on a small budget. “All the teams I worked with had huge respect for the environment they were working in, for the animals they were responding to, and for the people who were affected by whale entanglements,” said Ellie. Ellie also met with fishermen affected by the issue of whale entanglement, and learnt about how conservation efforts in different areas had taken contrasting approaches to working with them. She concluded that fishermen must be given the opportunity to lead attempts to reduce the threat of entanglement in areas where whales and fishing gear overlap. “On the east coast of the USA, fishermen felt excluded from discussions and attempts to reduce the entanglement risk, which had created a real ‘them and us’ divide,” added Ellie. Now back in the UK, Ellie is writing a report based on her findings which will be shared widely. As a member of the UK’s largest whale disentanglement team, she will share what she has learned about disentanglement responses, tool kits and protocols. She has been invited back to Cape Cod and Newfoundland next spring to complete further disentanglement training, and she hopes to facilitate communications between fishermen she met during her trip and those living and working in Scotland to share ideas and concerns.